Marquette trailed early before taking control of the game with strong shooting and frequent trips to the free throw line. The 67-59 victory earned MU third place in the Orlando Classic, finishing behind champion Kansas and runner-up Michigan State. Coach Wojciechowski called timeout with 11:57 remaining in the first half and his team trailing 17-6. After some spirited conversations in the huddle, Marquette outscored Tennessee 29-13 en route to a 35-30 halftime lead. A 3-pointer by Tennessee freshman and 2014 RSCI Top 100 recruit Detrick Mostella cut MU’s lead to one with 10:35 left in the game. Marquette’s own freshman (redshirt) Duane Wilson responded with two NBA-range treys and the team never looked back. Postgame press videos are available for viewing below. Coach Wojo talked about his pre-game hand injury, calling it, “just a little flesh wound.” He was joined by senior guard Derrick Wilson. Pace: Average team possessions of 59 was a season-low for MU. Effective field goal percentage: MU 60.5%, Tenn 45.8%. 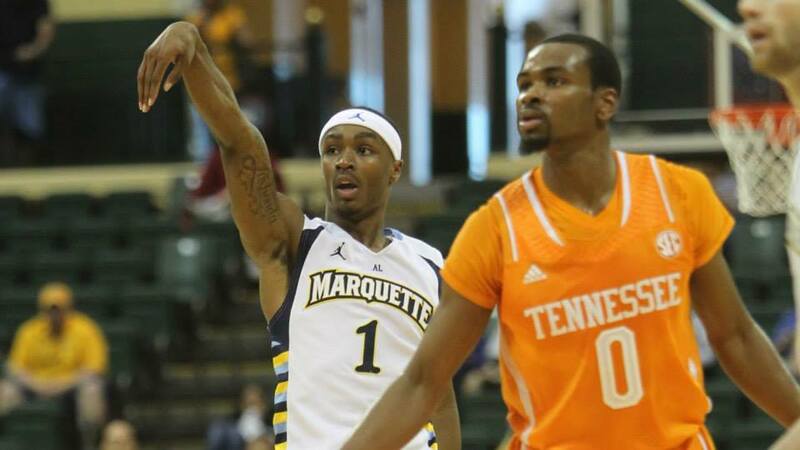 Marquette shot better in only three games during the 2013-14 season. This was the second time this season that MU has held its opponent to under-50% eFG. Turnover rate: MU 15.5%, Tenn 25.1% (using team-specific possession estimates). Marquette continues to their positive trend in turnover advantage. Three players had two steals each (Anderson, Burton and Derrick Wilson). Offensive rebounding percentage: MU 19.2%, Tenn 51.4%. The Volunteers dominated the boards, led by Armani Moore’s 13 (8 offensive and 5 defensive rebounds). Second chance points were in Tennessee’s favor 12-5. Free throw rate: MU 53.5%, Tenn 10.0%. Personal fouls called were 24 on Tennessee and only 10 on Marquette. The Volunteers settled for a lot of jumpshots and 3-pointers (3/20 3FG) while Marquette attacked the paint more often. Redshirt freshman Duane Wilson was excellent as he tallied 30 points on 9/17 shooting (5/9 3FG) and 7/8 free throws. His eFG% for the game was 67.6%. Derrick Wilson was a perfect 4/4 from the field, including 1/1 3FG. He had 11 points, 2 rebounds, 2 assists, 2 steals and no turnovers in 36 minutes of play. Juan Anderson was only 2/8 from the field and had 4 turnovers, but he did grab 8 rebounds (3 offensive), had 3 assists and 2 steals. Up next are the Wisconsin Badgers. That game is Saturday, December 6 in Milwaukee.